EcoIslands LLC of Altoona PA, consultancy for Aplacas of the Alleghenies, will be using fresh and composted alpaca poo in order to make compost tea. This raw/compost tea will be used on an Acid Mine Drainage Site as a source of Organic Carbon for the synthetic wetlands installed by EcoIslands LLC. The process of anaerobic digestion provides ammonia and organic carbon in the form of the microbes living and digesting the poo, which are consumed (providing carbon) by and for Manganese Oxidizing Fungi which treat the polluted mine water to meet quality standards. Alternatives to synthetic wetlands and compost tea remediation include caustic soda, multi-acre ponds, hundreds of yards of compost and, on average, 10-100 times the capital cost. Since my response is not of the cheerleader approach, I would like to have a similar blog. My opposition is as follows: When a judge is presented with the entire blanket to judge – the placement of the ribbons is a result of what they have before them. They can examine, touch and make a determination. I do not want to open a can of worms or be a Debbie Downer, but scientific results can be manipulated which could change the end result. In my earlier years in the alpaca industry, I was very naive about several alpaca related issues until a Very Reputable; Highly Respected alpaca farm owner shared this during our discussion of Histograms: The woman grabbed a hand full of fleece, held it up to the light, plucked out the primaries and...You have manipulated results. A far better outcome than if the entire sample had been submitted. That farm DOES NOT submit samples for histograms because of the above. Don’t get me wrong, there is a VERY IMPORTANT place for scientific testing – only if we can assure the sample has not been altered. You have the option of publishing your EPD results or keeping them private. If scientific testing is part of your program, by all means, continue, but I don’t want it to be part of the fleece judging. Your thoughts? 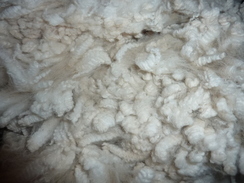 Do you think the scientific results should be part of the Judging of the Fleece?